After their Niwot, Colorado, home was inundated with floodwater and mud in the historic 2013 flood, the owners brought their “glass is half full” zest for life to the process of restarting their lives in a modest budget-conscious home. It wouldn’t have been possible without the goodwill of neighbors, friends, strangers, donated services, and their own grit and full engagement in the building process. Water-shed Revival is a 2000 square foot home designed for social engagement, inside-outside living, the joy of cooking, and soaking in the sun and mountain views. The lofty space under the shed roof speaks of farm structures, but with a twist of the modern vis-à-vis clerestory windows and glass walls. Concrete floors act as a passive solar heat sink for a constant sense of thermal comfort, not to mention a relief for muddy pet paw cleanups. Cost-effective structure and material choices, such as corrugated metal and HardiePanel siding, point this home and this couple toward a renewed future. I love that sink! What is the style called? - That setup is perfect for our laundry area. What would you call that sink type? It adds so much character, don't you think? Dog-washing station. 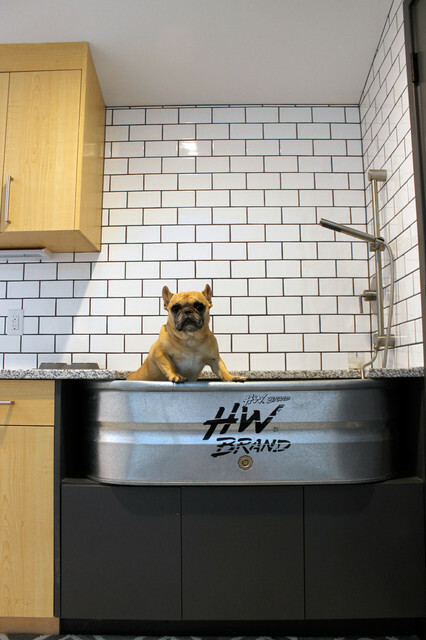 A stock tank resting on an open shelf above cabinets makes a handy dog-washing station. Displayed front and center, it reflects the farm-like vibe and utility of the home’s shed roof and cost-effective materials.